YOUR HOME SEARCH STOPS HERE! CONTEMPORARY STUNNER WITH MANY IMPROVEMENTS IN A FRANK LLOYD WRIGHT STYLE ON 5 + ACRES. OPEN FLOOR PLAN, LOTS OF WINDOWS AND NATURAL LIGHT. FIRST FLOOR MASTER SUITE WITH DIRECT ACCESS TO THE DECK, LOFT OFFICE, SECOND FLOOR LAUNDRY, AND SPECIALLY DESIGNED HOME THEATRE. POTENTIAL FOR FOURTH BEDROOM. WALK FROM YOUR BACKYARD TO ACCESS SPENCER CREST NATURE CENTER'S TRAILS AND PONDS. 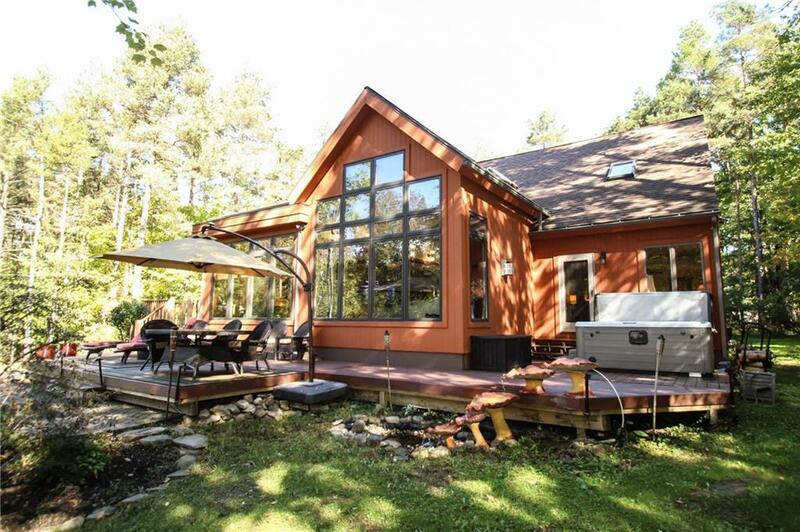 ENJOY MODERN LIVING ON A PRIVATE WOODED LOT. VIDEO TOUR SAYS IT ALL!